- Link Ball 3x2.5: Remove original one using Hex Screw Driver 1.3mm and heat with lighter or solder iron the ball in order to remove it easy. Remember add lock thread once new one linkage ball are installed, not over tighten. - 2x5x2 Radial Bearing: Original bearing are installed with lock thread compound to assure the best assembly precision, the fast and easy way to unlock the bearing form they position is put 5 minutes in boil water. Use smaller pliers to manipulate it and with a 1.5 hex screw drive you can easy pass true the bearing holes and push out the bearing. Dry and clean the parts before insert new bearing, Remember to add a thinner layer of Blue lock thread around the outside bearing ring and insert the bearing just like you remover it. To push in place the bearing you can operate with 3 mm hex screw driver. - O-Ring Silicone Red: insert it pushing carefully with fingers over the link ball; don′t use tools that can easy damage it. 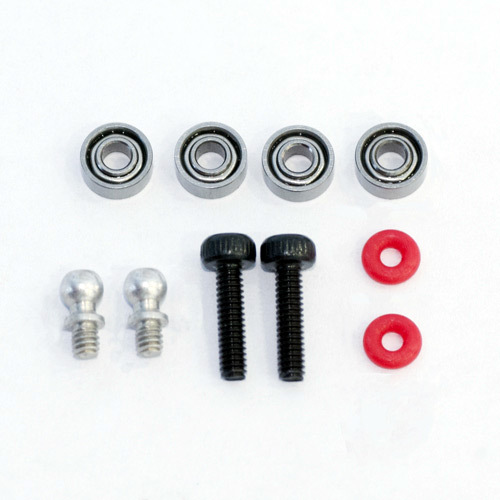 - Hex Cup Screw M2x8: These screws just replace the original one used to lock main blade.